﻿﻿ Construction of multispecies allometric equations: Is there a statistical palliative for destructive tree sampling? Construction of multispecies allometric equations: Is there a statistical palliative for destructive tree sampling? To avoid the problem of destructive tree sampling, we tested an indirect estimation procedure whereby aboveground tree volumes are estimated using affine-transforms of traditional bole volume equations. 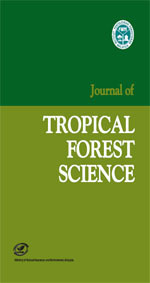 The study compared the predictive performance of the (1) proposed procedure, (2) allometric aboveground volume equations, and (3) simple upscaling of empirical tree bole volumes (serving as benchmark procedure). The study assessed speciesand tree-individual random deviations from mean procedure effect on prediction errors. Six volume equations were each fitted to aboveground volume (a- version) and bole volume (b- version); predictions of latter volumes were affine-transformed to estimate aboveground tree volumes. Bole height, total height and diameter at breast height (dbh) were measured for 59 trees from 10 species in eastern Cameroon. The Schumacher and Hall equation ranked first in quality-of-fit. The direct and indirect approaches applied with this volume equation predicted the aboveground tree volumes equally well across all species (groupings), with bias (± RMSE of 0.153 ± 2.512 and 0.178 ± 2.56 m3 respectively. Finally, trees within species accounted for 49.3% of the total variability in volume prediction error vs only 3.5% for species. Recommendations have been made for improvement relatively to data requirements and model building. Authors: Mayaka, T.B. ; Eba'a Atyi, R.; Momo, S.T.